Music Choice recently sat down with Andy Partridge and Colin Moulding to get the inside scoop on the latest XTC release, Wasp Star (Apple Venus Volume 2). Andy Partridge and Colin Moulding ended seven years of silence with last year's orchestral Apple Venus Volume 1. For their latest release, Wasp Star (Apple Venus Volume 2), the duo expended more energy pounding in nails than drawing up sketches, and with reliable old tools - electric guitars - that had been locked up in the XTC shed during the recording of last year's album. Unlike its daintier predecessor, Wasp Star buzzes about, packing the sting of crashing drums and even the occasional muscle-guitar lick. "This is definitely an 'up' record, he continues, citing the joys of recording in Moulding's garage-turned-studio. "The mood was very light, and the album had the least amount of birth problems." After sitting on their new crop of songs for several years and then realizing that the songs fit nicely into two categories, orchestral and electric, they decided to release their eleventh and twelfth albums as two separate, but equal, volumes. "It's two different animals," Partridge explains. "We had pigs that we herded into one area, and we had sheep that we herded into another. But they're all four-footed farm animals with 'XTC' branded on them." This time around, the sheep (or pigs, depending upon how you interpret XTCisms) are up to their hooves in new love, bitter breakup, rebirth and decay. "Stupidly Happy," a song Partridge erected from a Keith Richards-like riff, finds him in a state of romantic elation. "I was drunk on love when I found that riff," he says. "I'd had a loving lobotomy. "It felt great to lean over and pick up that electric guitar and go, 'Rrrrr." "We're All Light," which consists of goofy pick-up lines strung together ("Don't you know we're all light/Yeah, I read that some place/So you won't mind if I kiss you now/Before indecision can bite"), finds Partridge happily partaking in a new relationship. The seemingly upbeat "Playground," which is reminiscent of great XTC singles like "Towers of London" and "Senses Working Overtime," packs a sour punch, with Partridge crooning "You may leave school but it never leaves you." "Boarded Up," is Moulding's offering of decaying Swindon, the post-industrial English town XTC have called home since the band's birth. "No bands come to town to play anymore," he laments. Now that all of their seven years' worth of work is seeing the light of day, Partridge and Moulding don't have any set plans. "I have nothing on the horizon, which is exciting and frightening," Partridge says. "We couldn't write another note until we knew that these two beautiful babies (Volumes 1 and 2) were crawling and running around the nursery. Because we knew they were gonna be good kids." 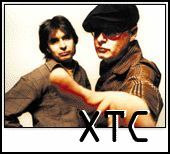 XTC will not be touring behind Wasp Star. Partridge even rebukes the notion of someday doing a more refined tour, like the one his stage fright-stricken hero Brian Wilson is about to undertake with a symphony orchestra. "There's a million things I'd rather do than tour," he says. "I think the driving force behind the majority of tour is "I'll go and show off in front of as many girls as I can, with my gang,' or it's, 'We need the money.' The former is ludicrous, and the latter is pathetic, and rather sad."